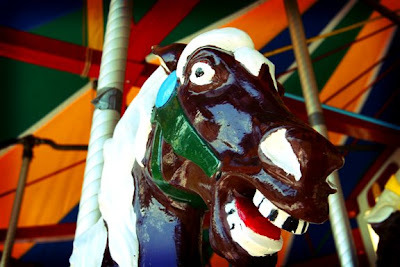 I'm not sure how much this wacky looking carousel horse is supposed to entice little kids to want to ride it. We went to a park yesterday for a bike ride and there was a carousel that I thought would make for some great shots. Until I got up close and realized these are the scariest looking carousel horses I have ever seen. As I was going through the shots this one stood out because this is what a 4 or 5 year old might see as they are getting onto the carousel. Seems like something that might make an appearance in a nightmare. Now I feel like I need to find other carousels to see if all the horses are this psycho looking.